On the 1st of March, 2019, President Hon. 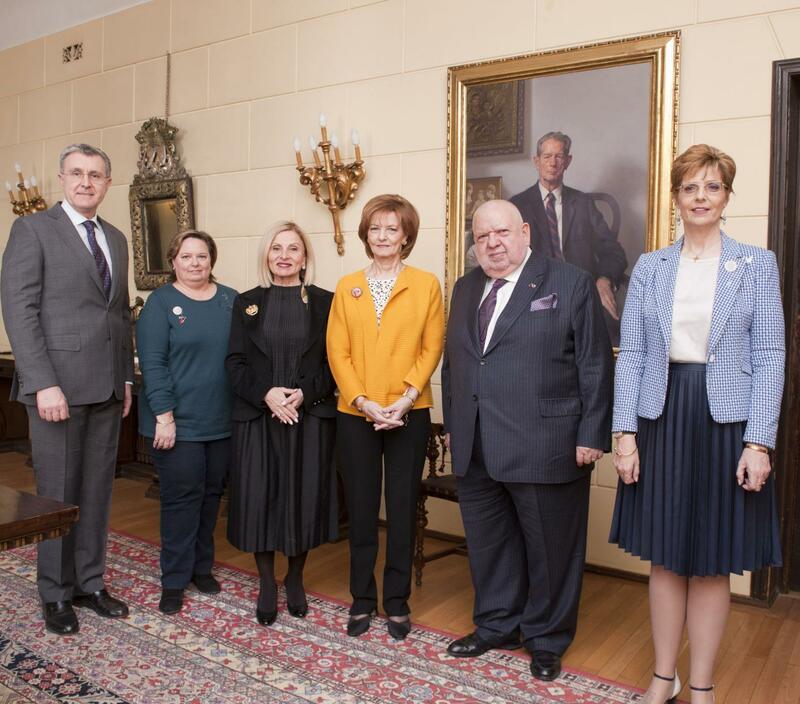 A. Eken and Mrs. Eken were received by Her Majesty Queen Margareta of the Romanians and His Royal Highness Prince Radu of Romania at Elisabeta Palace for a friendly lunch. 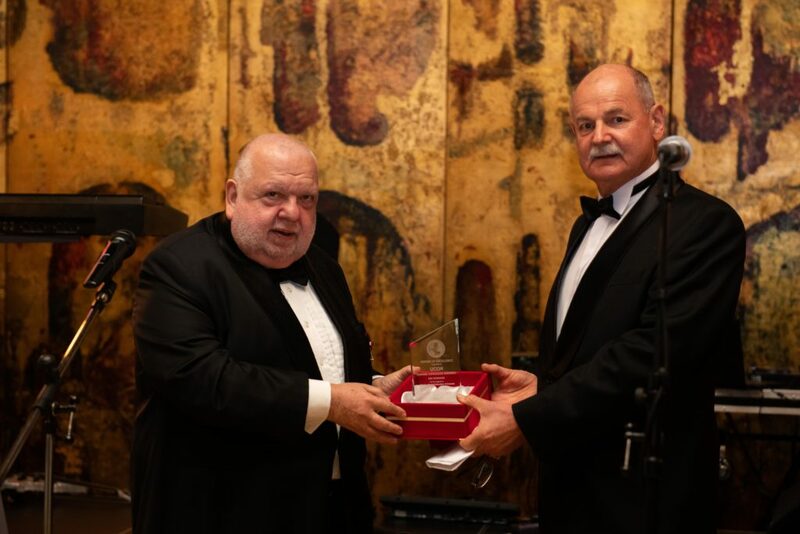 On the 2nd of March, 2019, the Union of the Honorary Consuls of Romania – UCOR – invited President Hon. Eken and Mrs. Eken to attend the “Spring Ball” to support a charity project to raise funds to purchase medical equipment in benefit of the children from the Palliative Care Center Hospice Sibiu, Romania. 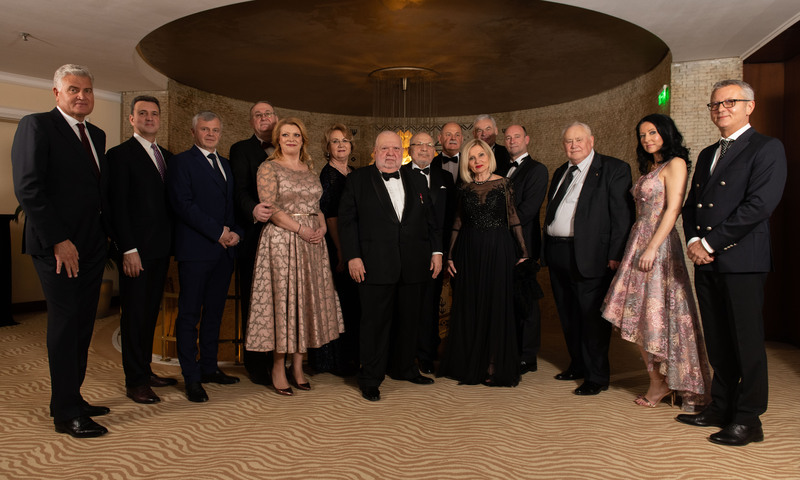 Ambassadors, high representatives of the Ministry of Foreign Affairs of Romania and members of the business community were attending this Gala dinner. It is an honor for me and for the honorary consuls colleagues, members of the Union of the Honorary Consuls of Romania, to host at the beginning of this year, this reunion with your Excellencies, which we want to become a tradition, great opportunity to socialize and meet in less formal, but significant place. I greatly value the good cooperation we have had so far and I hope we will continue to strengthen our relations during the year 2019. I would like to express gratitude, on behalf of myself and the honorary consuls and our association, for the presence of your Excellencies, Distinguished Ladies and Distinguished Gentlemen Ambassadors, at our event. We welcome the presence of the Representatives of the Diplomatic Corps as well as the business community in Romania, this evening. 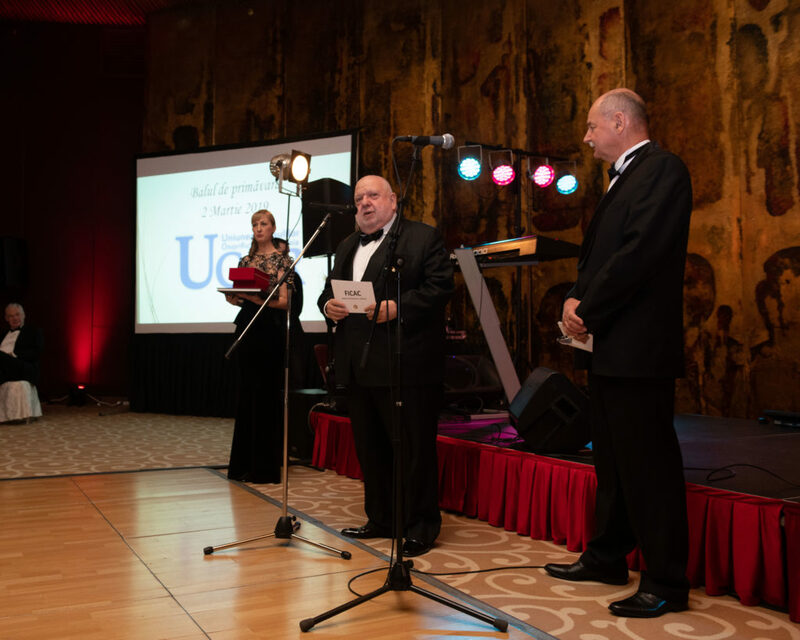 This year, the Union of Honorary Consuls in Romania celebrates fours years of existence, gaining more force, recognition and prestige every day. It is worth mentioning here, the affiliation of the Union of Honorary Consuls in Romania to the World Federation of Consuls, a moment of the history of our Union, for which I wish to present to Mr. President Aykut EKEN our gratitude and to express my thanks for being present at our event. I am glad to mention the signing, a few days ago, of the “Cooperation protocol between the Ministry of Foerign Affairs and UCOR” that we consider to be a historical document in the existence of UCOR. I take this opportunity to thank our Colleagues in the Organizing Committee, especially Mrs. Georgiana Pogonaru – Honorary Consul of Iceland in Romania -, for their efforts in making this event possible. Allow me to introduce Hon. Aykut EKEN – President of the World Federation of Consuls -, who would like to say a few words ! Thank you, Mister EKEN for your words and the beautiful thoughts you have shared with us. Please, allow me to wish a pleasant evening ! Enjoy ! We invite you to dance ! FICAC was founded on the 2nd of October 1982 in Copenhagen by Consul General of Monaco in Denmak, Honourable Vagn Jespersen, and his Colleagues from Finland, Greece, Iceland, Italy, Norway and Sweden. FICAC is recognized by UN as NGO ECOSOC Special status, also as NGO by OAS and EU. FICAC is following UN Rules and has memberships in more than 90 countries. General Assemblies of FICAC are organized every 3 years, last one in October 2018 at the Belgian Senate in Belgium, next one in Seoul, South Korea in 2021. Being member of the Board of Directors since 2000, I was elected President in 2015 and re-elected in Brussels for a 2nd term. We have several Central and Regional Committees, one is chaired by my wife about “Women in Diplomacy”, with Members like H.E. Adriana Ciamba, Consul General of Romania in Istanbul. FICAC has honoured several Head of States with its highest honour, the FICAC Gold Star, but also His Holiness Pope benedict XVI and H.A.H. Bartholomew, Archbishop of Constantinople, New Rome and Ecumenical Patriarch. Every 3 months, we are organizing Board of Directors in different countries, next week in New York, where Directors will meet with H.E. Antonio Gutteres, Secretary General of UN, but also some courtesy visit to US Congressmen in Washington DC. 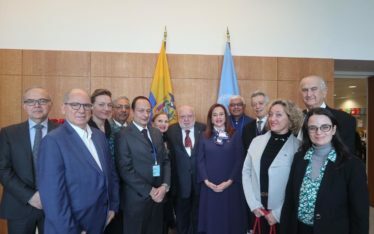 FICAC is concerned to closely follow the 17 UN sustainable development goals for 2030. Consular relations have been established between peoples wince the ancient time with the development of international trade and economic interests of states. At that time, prominent citizens of city state developed trade friendships with other city states and got some role between both cities: today, we call them honorary consuls. These prominent citizens were using all their contacts and their influence to support friendships and alliances. For instance, Kimon, a proxenos of Sparta in Athens who operated there even before the outbreak of the first Peloponnesian War, nearly 2,500 years ago. The origin of honorary consuls can be traced back to the 8th century, especially to China, India, and the middle eastern regions and in Greece in the 12th century. The official Consular Corps was first established in France at the end of the 18th century. As FICAC, our main objective is bridging the world: we are looking to bring altogether Honorary Consuls from all around the Globe, not only to share experiences, but also to coordinate efforts to strengthen their rights, their responsibilities, their status and their security. All of us, we need Cooperation, Goodwill, Friendship, Serenity, Love, Happiness, Success, Patience, Tolerance and last but not least Health and Peace.